- Publisher Imagine you have only one week to live. Visions of how your loved ones will carry on after you are gone consume your every thought. Every interaction, every conversation takes on a new urgency. You want to be sure that those closest to you know your whole heart. That is the premise behind this fascinating, gripping book by Jeff Walling, who also authored the provocative Daring to Dance with God. 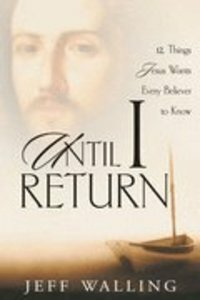 Until I Return examines Christ's parting teachings from the Gospel of John, chapters 14-16 -- heavy with importance, bursting with significance. This book is full of vital last-days lessons that are particularly crucial for our times. Examining some of Christ's deepest teachings, this is a book you can read for yourself or give to others -- so all of your loved ones can better prepare for the coming of Christ. - Publisher Walling examines Christ's parting teachings from the Gospel of John. Full of vital last-days lessons that are particularly crucial for our times, this book can help you and your loved ones better prepare for the coming of Christ. Imagine you have only one week to live. Visions of how your loved ones will carry on after you are gone consume your every thought. Every interaction, every conversation takes on a new urgency. You want to be sure that those closest to you know your whole heart. That is the premise behind this fascinating, gripping book by Jeff Walling, who also authored the provocative Daring to Dance with God. Until I Return examines Christ's parting teachings from the Gospel of John, chapters 14-16 -- heavy with importance, bursting with significance. This book is full of vital last-days lessons that are particularly crucial for our times. Examining some of Christ's deepest teachings, this is a book you can read for yourself or give to others -- so all of your loved ones can better prepare for the coming of Christ. Walling examines Christ's parting teachings from the Gospel of John. Full of vital last-days lessons that are particularly crucial for our times, this book can help you and your loved ones better prepare for the coming of Christ. Jeff Walling has spent the last twenty years preaching and teaching about Jesus. His passionate style and dramatic delivery have made him a sought-after speaker, lecturing to tens of thousands annually at Christian universities, evangelism seminars, and conferences worldwide. He has written such books as "Daring to Dance with God, Hugs for Grads", and "Until I Return". Jeff lives in Charlotte, NC, with his wife, Cathryn, and their three sons, Taylor, Riley, and Spencer, where he has served as a minister since 1984.